Best Shrimp Grits Ever! Seriously. This recipe for shrimp and grits is my version of a restaurant main dish we enjoyed while vacationing in Wrighstville Beach and the North Carolina Low Country. “Have you ever had Shrimp and Grits?” We lived in Asheville, North Carolina at the time and the question was constantly being asked of us. Everyone was surprised that we had not sampled it yet. What was so special about grits? 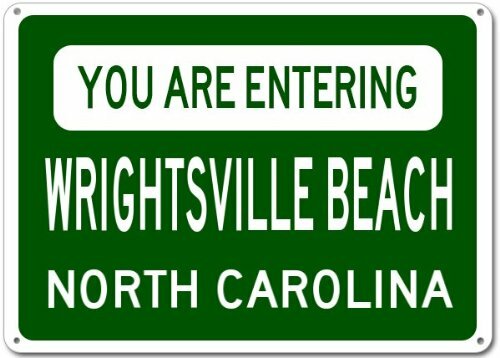 It would be close to 35 years before we found ourselves surf side near Cape Fear. At the top of the menu? Traditional shrimp and grits. On a recent 4-day trip to the North Carolina Outer Banks, our singular mission was to eat as much local seafood as possible. I wanted to sink a fork into a dish of shrimp and grits. It was on the menu at a well known Wilmington restaurant. Ignoring the rest of the fabulous menu, I did not hesitate to order their version of Shrimp and Grits. As expected, the dish was every bite as good as we imagined it would be. I’m not even going to try to tell you about the regional, more authentic, local versions of the best shrimp grits ever. There are simply too many to mention. As in many recipes, it comes down to individual cooks. But…with the simple addition of meat, crustaceans and seasoned with onions and garlic, ground corn was elevated to the level of an amazingly flavorful meal. To our palate, the best shrimp and grits platters are found in North Carolina but we have adapted our Wilmington restaurant favorite to serve any day of the week. It is also a favorite of dinner guests. For the longest time, I even resisted the offer to try a plate of plain grits, either topped with butter or cheese. In fact, there was a time when the mere idea of eating ground corn was not exactly appetizing…until hunger drove us to a Waffle House one morning during a road trip from North Carolina to Pennsylvania. Grits From The Waffle House©? A Waffle House may not be the ideal location to develop a taste for such a regional culinary specialty as grits but if you become hooked on straight up, creamy grits then the addition of seafood or any other gourmet ingredient can only make the grits tastier. So it was that years later, we ordered shrimp and grits for dinner. In an instant, plain grits quickly took second place on the list of breakfast menu favorites. 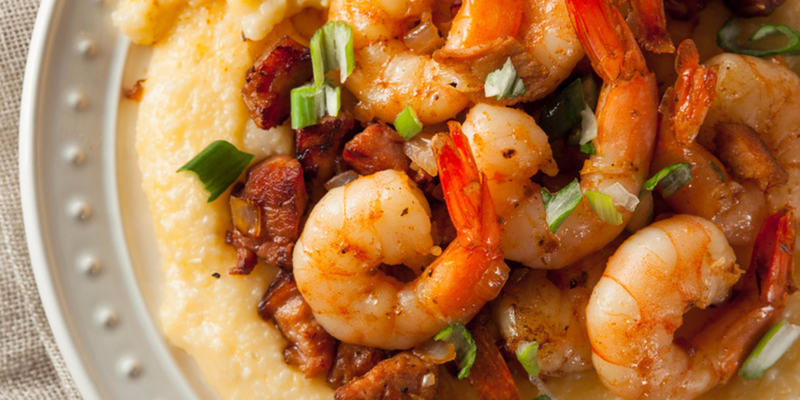 Far from being the breakfast food we had come to enjoy, grits (or polenta or hominy depending on which part of the country you hail from) proved to be the perfect foil for wine infused seafood, bacon bits and aged cheddar. It’s Easy To Make The Best Shrimp Grits Ever! As expected, the dish was every bite as good as we imagined it would be. Yet…In my mind, I expected grits topped with a well seasoned shrimp mixture to have more of a contrast in flavor intensity between the seafood and the grits. Some dishes are mellow in flavor but the addition of mushrooms and roasted tomatoes to this combination were not necessary in my “home chef” opinion. Any number of alternate ingredients, combined with seafood as a topping for grits would impart more zing than mushrooms and tomatoes. Both mushrooms and tomatoes produce quantities of liquid which dilute just any any flavor. Love them in soups and stews but with shrimp, these two ingredients were unexpected. So…being one to always tweak a recipe, I set about to deconstruct that particular dish and recreate it to suit our taste buds – you know…kick it up a notch. We tried it the way the chef prepared it then we changed the recipe! 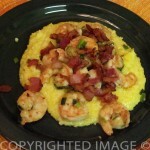 A quick and easy way to recreate a restaurant shrimp and grits recipe to suit our taste buds. Prepare the grits as directed on the package adjusting the proportion for the number of servings required. Slowly add 1 cup corn grits. Reduce heat and stir constantly for a couple minutes. Reduce to low heat and continue stirring for another 5 minutes or until thickened or place your pan on a stove top heat diffuser. You don’t want the grits to burn to the bottom of the pan. Just before serving, add butter and shredded cheese. Chop the bacon into small dice and fry until crisp but not burned. Drain on paper towel and set aside.Remove most of the bacon fat. To the pan, add chopped scallions and garlic. Fry for a couple minutes but do not burn.Add the raw shrimp to the mixture.Cook the shrimp only until pink, turning them constantly so they cook evenly. To de-glaze the pan, I add a few ounces of white wine. Spoon the grits onto a plate and top with shrimp mixture. Sprinkle bacon bits on top of shrimp. Et voilà, shrimp and grits! Serve immediately and enjoy. Which Wine Do You Serve With Seafood Entrées? 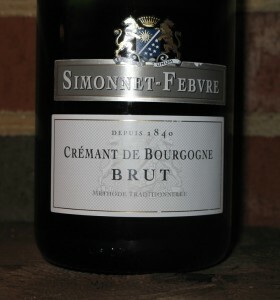 It came recommended and turned out to be the perfect sparkling white wine to go along with both the grilled swordfish and the shrimp selections we ordered that evening. After the meal, we were tempted by the scrumptious deserts listed on the menu, which were served in gargantuan portions. Imagine sipping on a sparkling wine as you eat a light coconut cake filled with white chocolate ganache and key lime curd, then topped with fresh coconut curls. If you an, also imagine too a soup bowl filled with crêpes Grand Marnier; each crêpe filled with white chocolate ganache, then topped with raspberry sauce. Imagine a key lime ice cream confection that defied imagination. “Colossal” size shrimp can regularly be purchased for a very low price at any Giant Foods© seafood counter around Woodbridge, Virginia. Here is another version of this dish! While it was quite tempting to purchase a pound of shrimp at that price, they were really too large for this recipe. You can always cut the colossal sized shrimp into smaller pieces but for a whole shrimp visual, “Large” shrimp are just right for this recipe. 1.2 Grits From The Waffle House©? 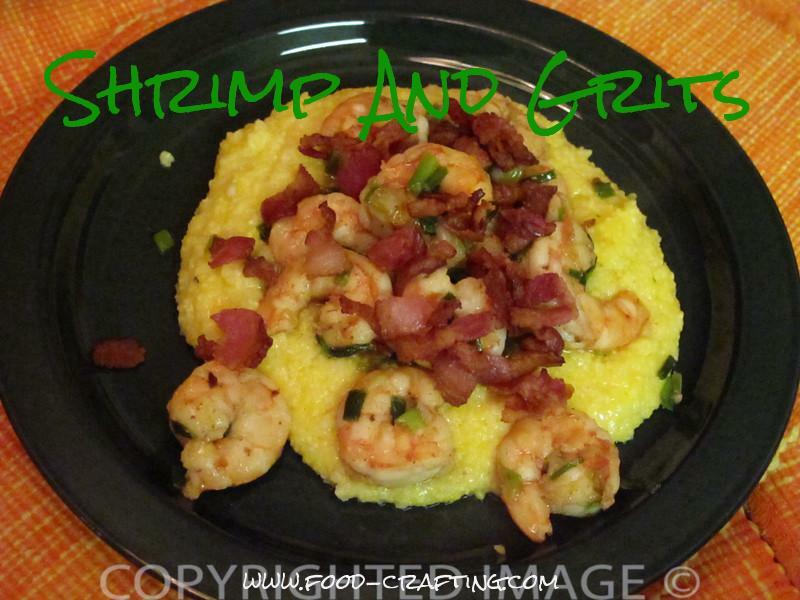 2 It’s Easy To Make The Best Shrimp Grits Ever! 3.4 Which Wine Do You Serve With Seafood Entrées? Champagne and grits. Sounds good to me!